From artful gifts and jewelry, to apparel and gear that makes it easy to enjoy the extensive great outdoors of the Inner Banks, The Four C's has everything visitors need to discover the historic town of New Bern in style. 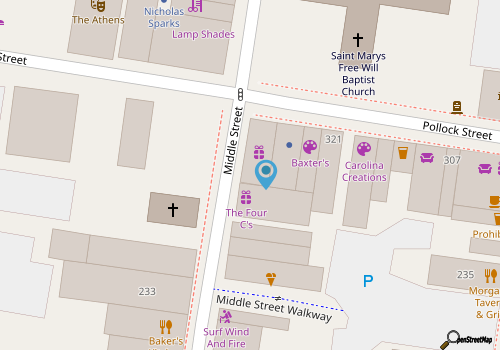 Situated in the heart of the downtown area in one of New Bern’s famed brick buildings, this distinctive shop features a world of goodies and treasures within its walls to delight outdoors lovers and everyday shoppers alike. There’s a wide variety of goods to be found in this all-encompassing store that focuses on outfitting visitors and locals with the best clothing and gifts, and which has been a favorite shopping destination for more than 20 years. Shoppers can expect to find an array of famed and popular brands for outdoor adventures, including The North Face, Eagle Creek Travel Accessories, Dansko, Crocs, and Keens, which are ideal for comfortable walking tours and explorations. In addition to the varied apparel, The Four C's also offers camping and hiking gear, outdoor books and guides, cool science and nature items that will fascinate kids of all ages, and outdoor supplies of all varieties. From stylish accessories to the essentials that modern adventurers require, The Four C's truly has it all when it comes to New Bern expeditions. Call 252-636-3285 for current hours.